The story of a rebel force that defies a Deity has been a topic of great fascination for authors and poets for millennia. There are para-biblical stories about how angels defied God to sleep with mortal women and bear children. John Milton creates a vivid mythos around Satan as a tragic character. Greek poets speak of Prometheus who defied Zeus and was condemned to eternal torment in a similar fashion. The question most people seem to have is where did the story of the watchers come from? I’ve mentioned the three passages under the descriptions of Watchers and Lucifer on the demon page, but just to put everything together, I thought I’d put the two stories together. Before doing so, let me briefly say that the question of evil has plagued theologians and philosophers for millennia. In Judeo-Christian thought, the problem was more pronounced – if God is an omnipotent being that is entirely good, how can evil exist? Why would God create a world that was not entirely ‘good’ in the first place, and even if he did create evil, why would he allow it to continue to exist? Put another way, why do the righteous suffer while the wicked prosper – issues addressed by Jeremiah and Job. The fallen angels accounts attempt to offer a mythological explanation – part of God’s subordinates sinned against him and corrupted humanity in the process. Generally, there are 2 flavors of the fallen angels myth. 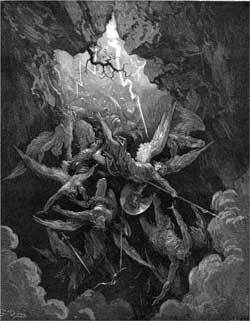 The first describes a group of angels who, lead by Azazel, lusted after the women of earth. They defiled themselves by mating with humans and their consorts gave birth to mean-spirited giants. God was not pleased with the rebellion and punished them for their misdeeds, but not before humanity was corrupted in the process. This tale is introduced in Genesis 6:1-4 and elaborated on in the Book of Enoch, part of the Jewish Pseudepigrapha which is a collection of works not found in the bible. The other story involves the mightiest angel who, out of pride, rebelled against God during the time of Creation. This mighty angel (Lucifer) sought to overthrow God, but he failed and was cast out of heaven to become Satan, the adversary. Then, out of contempt for mankind, he lead Adam and Eve to sin. In addition to these accounts, there is another account of the Satan who directly opposed God, but was never fully explained. As mentioned in the Watchers description, there are two potential biblical passages that refer to the first account of the fallen angel myth – Genesis 6:1-4 and Psalm 82:1, 5-7. To summarize, Gen 6 explains that the angels married women, but does not explicitly condemn this while Psalm 82 mentions that the angels sinned, but does not mention that the cause of their sin was that they married mortal women. There is no biblical evidence to support any connection between the two passages. There is only one potential passage referring to the second myth – Isaiah 14:12-15. Most scholars conjecture that this myth was derived from a lost Canaanite myth about a rebellion to overthrow El and Elyon. Bamberger, Bernard. Fallen Angels: The Soldiers of Satan’s Realm. Jewish Publication Society. ISBN: 1-56618-850-X, 1952. Republished by Barnes & Noble Books in 1995.